Dairy trade was exceptionally strong at Markethill on Tuesday, January 22nd selling to a top of £2,110 for a calved heifer from an Aghalee farmer the same owner received £1,940, £1,910 for calved heifers. 120 cull cows sold in a steady demand. 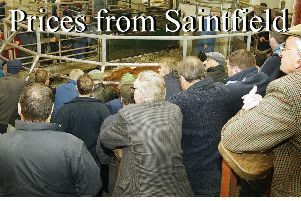 Beef bred cows to £125 to £139 for 640k at £895 followed by £138 for 604k at £835. Fleshed Friesian cows sold from £95 to £110 for 710k at £785 and up to £935 for 860k at £108. Second quality Friesians from £80 to £90 per 100 kilos and the poorest cows from £60 to £75 per 100 kilos. Newtownhamilton farmer 644k, £895, £139.00; Newtownbutler farmer 604k, £835, £138.00; Tassagh farmer 578k, £775, £134.00; Newtownhamilton farmer 898k, £1,185, £132.00; Newry farmer 686k, £865, £126.00; Whitecross farmer 776k, £965, £124.00 and Tassagh farmer 696k, £865, £124.00. Dungannon farmer 714k, £785, £110.00; Glenanne farmer 864k, £935, £108.00; Mountnorris farmer 680k, £735, £108.00; Dromore farmer 624k, £635, £102.00; Dromore farmer 656k, £665, £101.00; Tynan farmer 682k, £685, £100.00; Markethill farmer 706k, £675, £96.00 and Glenanne farmer 748k, £715, £96.00. Good quality bulls from £250 to £370 for a four week Limousin. Aberdeen Angus calves to £285. Heifer calves from £200 to £290 for a four week old Limousin and Aberdeen Angus heifers to £240 each. Limousin £370; Belgian Blue £335; Belgian Blue £295; Aberdeen Angus £285; Aberdeen Angus £285; Aberdeen Angus £275; Aberdeen Angus £275; Belgian Blue £270; Aberdeen Angus £260 and Belgian Blue £255. Limousin £290; Limousin £280; Belgian Blue £275; Belgian Blue £255; Aberdeen Angus £240; Aberdeen Angus £240; Belgian Blue £240; Belgian Blue £240; Hereford £230 and Hereford £225.